A young Sikh man born and raised in Glasgow was picked up by plain clothes policemen five days ago on the 4 November in Jalandhar, Punjab, India. 30-year old Jagtar Singh Johal from Dumbarton travelled to Punjab with his family on 2 October for his wedding and had been there for nearly five weeks when he was swooped upon. He had previously travelled to Punjab earlier this year in April for his engagement and stayed there for seven weeks without any difficulties. Whilst shopping in Jalandhar with his newly wed wife and a female cousin he was accosted, a sack thrown over his head, and he was forced into a van by men dressed in plain clothes. The family later found out the men were police officers. The family were also lied to about his whereabouts and his welfare. On 4 and 5 November they were unable to locate him. On 5 November he was presented in court and was placed in police remand for five days. However, his whereabouts and condition remain unknown and undisclosed. His family from the UK have been in constant contact with the British High Commission in India and several UK MPs, including his local MP Martin Docherty-Hughes since the day of his abduction. Martin Docherty-Hughes has expressed his concern at the present situation regarding his constituent and offered his full support to the family in the hope to achieve a positive outcome. He has also contacted the High Commission of India in London and the Foreign and Commonwealth Office and will be speaking to his elder brother when his flight arrives from Delhi later today. His brothers Gurjit and Gurpreet, aged 29 and 32 from Glasgow concerned for the well being of their brother and other family members flew out to India on the next available flight the day after he was picked up to try and obtain more information and encourage the British authorities to take the matter more seriously. However, they have been forced to return back to the UK following threats and false accusations in what has proved a perilous trip. The Indian authorities have declined to provide any information to the British High Commission or UK MPs regarding his whereabouts or condition raising the strong possibility he is being mistreated. His family in India are being harassed by the police with his maternal aunt, her daughter and his wife being arrested when they refused to hand over his British passport. All three have now had to go into hiding to avoid further harassment and abuse. His family in the UK have complained to the British High Commission about police harassment and intimidation. They have also raised serious concerns about the mistreatment of Jagtar at the hands of the notorious Punjab police and are concerned the British authorities are not doing enough for a law-abiding British citizen. A further court appearance is arranged for Friday 10 November, which may provide the first opportunity for the British officials in India to visit and talk to Jagtar and provide legal assistance. Lawyers familiar with police tactics have pointed out it is highly suspicious his arrest came four days after a ‘Jimmy’ Singh from Jammu handed himself to Indian police when he returned to India having spent several years living in the UK. It is highly probable he has returned to India on the understanding he will become an informant or been interrogated and provided names of others. 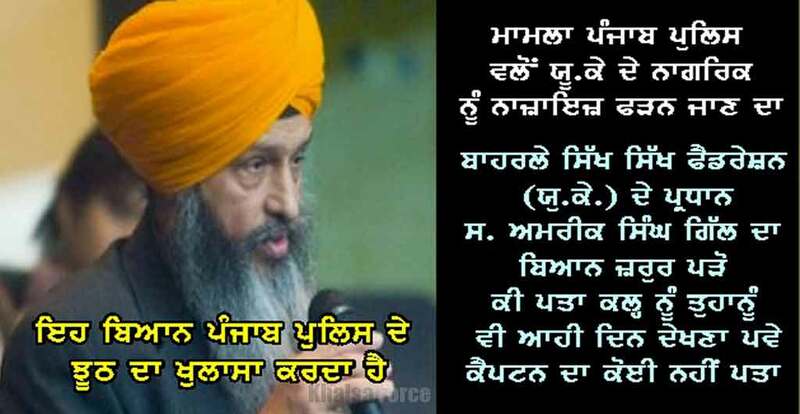 Police have suggested in Indian media reports that Jagtar’s only crime is he has been ‘running a magazine’ in the UK of atrocities during the 1984 Sikh Genocide and influencing the youth through social media. Sources in the UK suggest the Indian authorities are fabricating evidence or exaggerating his role. If the Indian authorities believed what he was doing in the UK amounted to breaking the law they should have raised this matter with the UK authorities so they could have taken appropriate action. This young man should be enjoying married life, but finds himself the subject of some sort of conspiracy hatched by the Punjab police and leading politicians. Two days ago the Chief Minister of Punjab was prompted by the Punjab police chief DGP Suresh Arora in a press conference to specifically mention the young man by name and pass a public judgement. The Chief Minister is getting a reputation for making outlandish and fabricated claims. He first targeted the highly respected Canadian Defence Minister Harjit Singh Sajjan during his official visit to India. More recently he targeted Jagmeet Singh, the newly elected leader of the NDP in Canada. In comparison making false claims about an unknown 30 year old Sikh from Scotland who is not even known in active Sikh circles in Britain is easy. Note 1: The Sikh Federation (UK) is by far the largest, most prominent and influential campaigning Sikh organisation in the UK that leads on political engagement for the British Sikh community. The organisation is often referred to as the first and only Sikh political party. The Sikh community in the UK and throughout the diaspora look to the organisation for leadership and direction.